A 6 petal, 124 grain Hollow Point design from a proven leader in self defense ammunition, the Federal Premium Law Enforcement 9x19 ammunition is a solid choice for extreme duty situations. The excellent expansion and the clean powders, high quality components and reloadability offer value adds for an already good value for 1000 rounds of ammunition that is suitable for all your defensive or duty needs, including tactical training. Moderate speed from the 124 grain build, the high tolerance controls and the quality checks at the Federal factory means you are getting excellent reliability, known performance, and long term viability on the shelf. 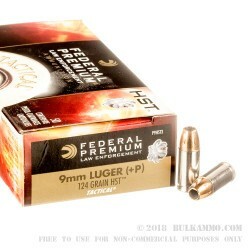 Federal ammunition always delivers for users; this self defense round will put you at ease, knowing that you have a capable, potent round when you need it. 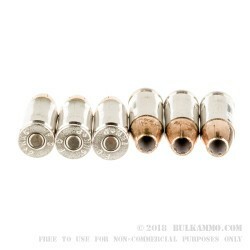 Nickel plated brass, boxer priming, super clean powders, and tolerances and quality checks that are far beyond many other competitors offer you a significant round for a great price point. 1200 feet per second of muzzle velocity that delivers 395 ft. lbs. of energy make this +P round a potent 9mm variant. It is suitable for any home defense, duty, or self protection firearm chambered in 9mm Luger. 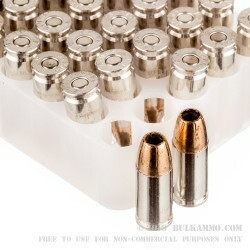 When you buy this bulk 9mm ammo case from Federal, you’ll get 20 boxes that each contain 50 rounds that are ready to fire. Q: Hello was curious what the fps and chamber pressure is for this round. 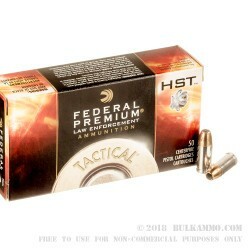 9mm +P Ammo by Federal LE Tactical HST - 124gr JHP ...thank you for your time. A: The item is advertised at 1200fps. The chamber pressure is around 38,500 psi.